The Pennsylvania Perimeter Ride Against Cancer was organized in 1983 by Bob Freed, an Allentown schoolteacher, in response to the cancer deaths of two family members and a friend. 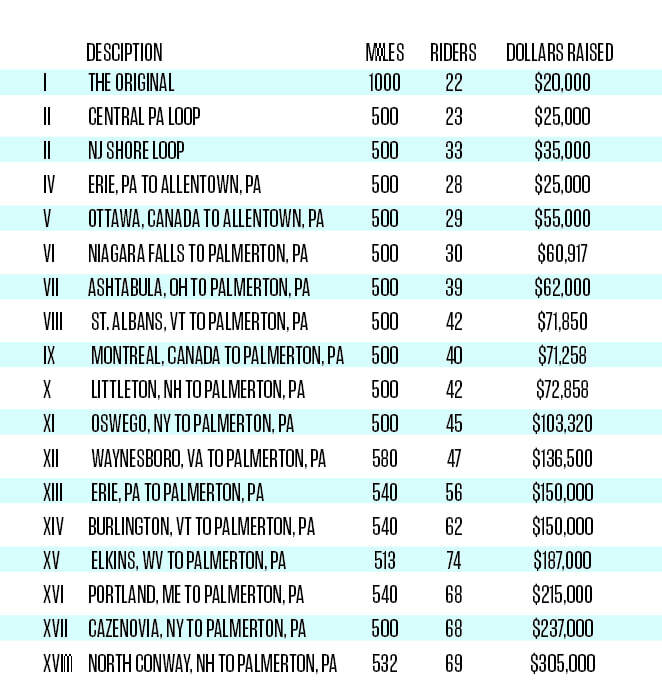 The original PPRAC, a ten-day journey covering 1,000 miles around the border of Pennsylvania - from which the "Perimeter Ride" takes its name - was completed by 22 riders and raised much-needed funds for the American Cancer Society. Since then, subsequent six-day rides have been completed every other year. Each ride covered approximately 500 miles by 25 to 70 riders who not only raised funds for the American Cancer Society but also donated to Dream Come True, a support organization for terminally and seriously ill children. To date, the PPRAC has raised over a million dollars to help fight cancer in the Lehigh Valley Community.